Don’t worry unduly, Vikings fans. Clive Standen hasn’t yet left Rollo behind as History channel’s most successful series ramps up for Season 5. Nor should he -- especially for this. 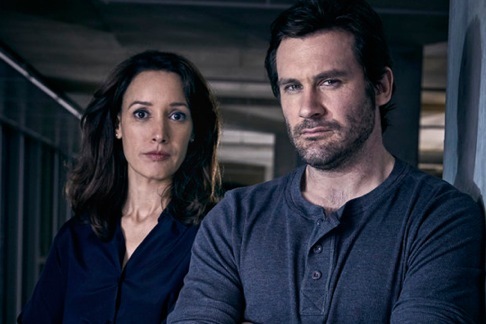 NBC’s misfiring Taken is billed as a 30-year prequel to the same-named feature film, with Standen stepping in to play ex-Green Beret Bryan Mills while Liam Neeson chills as the character’s older self. It’s a decidedly odd bit of business, though. The new Taken is set in the present day, even it’s supposedly three decades earlier. Such continuity inconsistencies likely won’t bother viewers who just want to see Mills fire weaponry and throw punches. He does lots of this as the grieving big brother of a sister whose death he hopes to avenge while also battling assorted other terrorists. Mills, a loose cannon with a thirst for mayhem, is recruited by terse CIA division boss Christina Hart (Jennifer Beals) after he careens through Thursday’s premiere episode. The action is constant, with some guilt-stricken brooding mixed in. Mills, a veteran of three tours of Afghanistan, is targeted by crime boss Carlos Meija (Romano Orzari), who blames him for his son’s death. As part of a planned payback, he takes out our anti-hero’s sister, Cali (Celeste Desjardins), during a melee aboard a train after Mills springs into action upon deducing that something’s amiss. By Episode 2, he’s already drawing the ire of a team member after going berserk during a training mission. “Something wrong with you, pal. In the head!” Mills is informed. Still, they need him. The cast includes Gaius Charles, best known for playing “Smash” Williams on NBC’s acclaimed Friday Night Lights. In Taken, he glowers a lot as a team member named John. For relaxation purposes, Mills very slowly unclenches himself in the company of Asha (Brooklyn Sudano), who had been Cali’s best friend. By Episode 4, he’s finally making some progress. Luc Besson, who produced all three Taken feature films, is also helming the TV version. Neeson is now 64, and there are no current plans for a Taken 4. So NBC’s all aboard, with Standen still a game 35 and already used to all that grimy rough-and-tumble on Vikings. That’s pretty much what you’ll get, a conveyor belt of death-defying and death-dispensing action scenes. Standen has physicality to burn in a series that pings from one crisis to another. It’s all enough to make the reconstituted team bond over beers at their secret lair after they wipe out a gang of human traffickers in Episode 2. “I don’t think we could have pulled it off without the new guy,” it’s grudgingly admitted. I don’t think NBC pulls this one off either. Best to keep your sword sharpened, Clive.